Pages are Young people, sometimes children. Archetypical teenager – Mentally restless – energetic and rebel – The troublemaker! The sky is filled with turbulent clouds and the trees in the background are obviously wind-blown, as is the young man’s hair. The waters behind the Page are rough and the general feeling of this card is one of tumultuous energy. They have a tendency to go completely off the rails, for instance driving the car while drunk, or stealing money from his mother to go party! She can be extremely communicative and nearly invisible. She/he may be a writer, a compulsive reader or a compulsive talker. This Young person can change direction and change his mind very easily. He is alert, quick, apparently devious and dishonest. The “page of sword “can bring a great distress to the family; usually, parents are the only ones to handle her/him. This behavior may include: drug taking, stealing, swearing, and more. Several situations may contribute to their struggle, like sexual abuse, learning problems, hyperactivity, divorce or bereavement. But there is great hope for the future, When this Young person grows up they are naturally drown to be teachers, scholars, scientists or philosophers. Work: the Page indicates that you may soon be dealing with some conflict at work if you are currently employed. If you’re looking for work, you may need to behave with a great deal of humility in interviews to land the position you’ve been hoping. 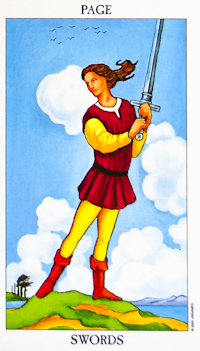 Love: the Page of Swords points to mild conflict. Know when to push and when to back off, many fights and discussions are not actually worth having (as long as your partner is treating you with respect.) Allow your partner to have his or her space. Don’t go with impulsiveness. Don’t argue anymore! Personality: changeable character, manipulative, secretive.